The Mercedes-Benz G-Class SUV brings drivers from the greater Toronto area an incredible off-roading experience and a vast range of cutting-edge features. These vehicles are bold, capable, and designed for drivers who demand exceptionalism. In a world where the SUV market is becoming less and less defined by outstanding performance and the toughest construction, G-Class models stand firm as a bastion of what SUVs can be. The Mercedes-Benz G-Class represents the cumulative engineering and design efforts of the industry’s leading minds over a legendary 37-year period, and yet each one is handcrafted to ensure the finest finished product. The sturdy ladder frame and galvanized steel body are hand-welded, the frame flowed with hot wax, and the wiring harnesses hand-loomed. Inside, you’ll find handcrafted designo® leather in as many as eight colours, plus five wood and carbon fiber trims. Each model takes more than 40 hours to craft, with strength, style, and luxury all coming together to create the most inimitable of machines. A tribute to the type of craftsmanship that defines the high-end product, each model ends its production journey with a thorough inspection from an expert — the same process that has placed every G-Class under intense scrutiny for over 35 years. The Mercedes-Benz G-Class range is equipped with a host of features to make your drive safe, effortless, and phenomenally comfortable. A DISTRONIC PLUS® cruise control system employs the latest radar technology to constantly measure the distance between your G-Class and the vehicle ahead, automatically slowing down and speeding up to compensate. Changing lanes is also made easier: at low speeds, the Blind Spot Assist system will monitor for vehicles entering your blind spot, then provide an indication on the appropriate side mirror. That cutting-edge sensing technology continues to make life easier when you’re looking to maneuver. Instead of having to crane your neck to check behind you while reversing, just use the live-feed from your rearview camera; instead of inching into the unknown, allow the PARKTRONIC sensors to guide you into tight spaces without incident. Bluetooth® connectivity lets you stay connected on the go, while an available Rear Seat Entertainment system brings video to the second row. Navigation keeps you on track, and mbrace® can sync your vehicle to your smartphone, allowing you to use an ever-evolving array of apps in your G-Class. All told, the Mercedes-Benz G-Class range is a cut above other SUVs. 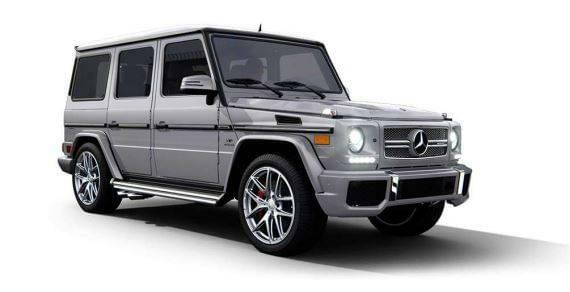 The 2016 G550 holds a new 4.0L biturbo V8 beneath its hood, ensuring up to 416 hp and 450 lb-ft of torque. The AMG® G63 and AMG® G65 go even further: the AMG® G63 is capable of putting you in command of up to 563 hp from a V8 engine, while the AMG® G65 places up to 621 hp at your disposal from a fiery V12. Each engine is handcrafted, displaying a single signature from the technician responsible. That kind of colossal power allows drivers to tackle the most challenging terrain, and each G-Class is fitted with the type of technology you need to continue conquering the untouchable. A G-Class permanent all-wheel-drive system continuously sends power to all four wheels to ensure a sure-footed drive, while the 4ETS® (4-wheel Electronic Traction System) delivers an optimal distribution of torque. Three sequentially lockable differentials can be locked in sequence from the dash, so you can maintain a flawless balance of torque and traction. The G550 SUV sends 416 hp and 450 lb-ft of torque from a 4.0L biturbo V8 engine to the control of your left foot, and offers an exceptional range of first-class features. The AMG® G63 is hand-built over 11 days and the 5.5L AMG® biturbo V8 powerhouse is handcrafted. It’s good for a thunderous 563 hp and 561 lb-ft of torque. 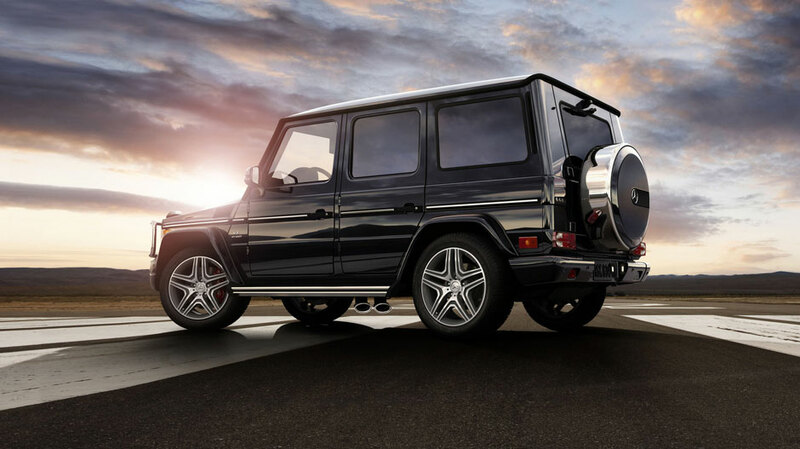 A giant among men, the AMG® G65 is for those seeking to command the extraordinary. It fits a handcrafted 6.0L AMG® biturbo V12 to deliver up to 621 hp and 738 lb-ft of torque. To experience everything that the G-Class has to offer, visit Mercedes-Benz Brampton at 10 Coachworks Crescent in Brampton, ON. We’re proud to serve the greater Toronto area with the full lineup of new models from Mercedes-Benz, and we hope to see you soon!